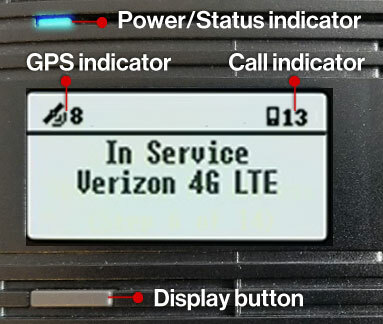 Display shows status messages and device icons indicating the number of LTE devices connected to the Network Extender and the number of GPS satellites tracked. If the Power/Status LED indicator is still blinking after one hour, relocate the GPS antenna to receive a stronger signal (see Temas relacionados). The screen goes blank if the Display button is not pressed for 30 seconds. Reference the device display to determine Network Extender status. The Power/Status LED indicator solid blue while the unit is on and in-service. Connected Users Shows the number of connected users. “No Ethernet Detected Check Connections” The Ethernet port or connection is not working. The port connecting your device to the internet is not operational. Please check that your Ethernet cable is connected correctly and the switch, router, or internet gateway is powered-on (see Temas relacionados). “Not in-Service The Network Extender has a communication failure with the Verizon network. There is a communication failure preventing your device from functioning correctly. Please unplug your device and then plug it back in again. “Not In-service The Network Extender has not acquired the initial GPS location or has lost GPS signal for more than 24 hours due to poor or inadequate GPS signals. The Network Extender is Not In-service. There is a failure in the GPS module preventing your device from functioning correctly. The initial GPS fix can take up to 60 minutes in poor conditions. Please make sure that the GPS antenna is installed in a location near a window (see Temas relacionados). “Not in-service The Network Extender has an IP address acquisition failure. Please check the Modem/Router settings, or contact your Internet Service Provider or Network Administrator. “Not in-service The Network Extender has overheated. Your device is overheating. Please move the unit to an area with an ambient temperature between 0-50 degrees Celsius (32 -122 degrees Fahrenheit) and make sure the device is in a well ventilated location. “Not In-Service Excessive Interference” The Network Extender is exposed to a high level of radio interference. If the problem persists after 10 minutes, please unplug the Network extender and look for a location to place it with weak existing coverage using your Verizon phone. If this location is using multiple Network Extenders, make sure there is at least 85 feet away from closest adjacent Network extender (170% of coverage radius distance). “Device Not Activated The Network Extender fails to authenticate to Verizon network. The device might not be provisioned in the Verizon network yet. Please unplug your device and then plug it back in again. Wait for 10 minutes and check if the alarm is cleared. “Out of Verizon’s Service Area” The Network Extender fails to come into service due to unlicensed area. You might be located in an area where no Verizon service is allowed. Please unplug your device and then plug it back in again. Wait for 10 minutes and check if the alarm is cleared.